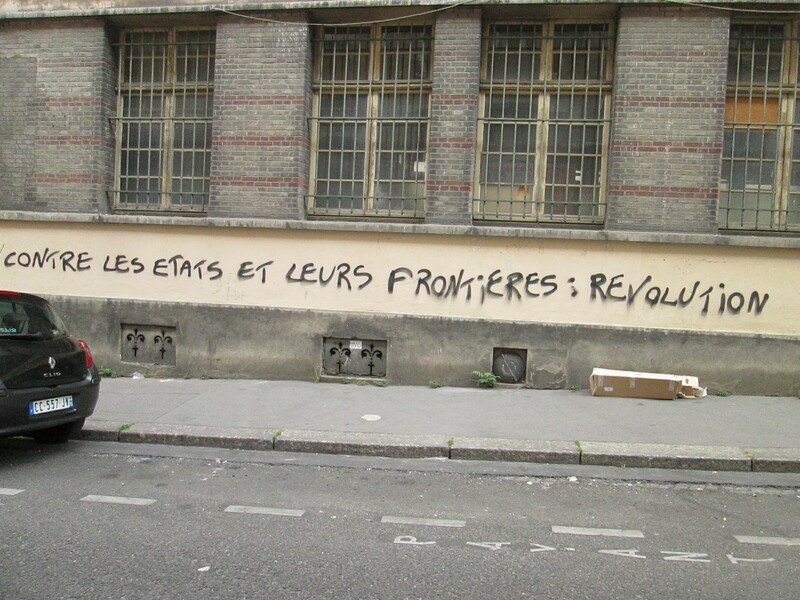 This text on the wave of sans-papiers occupations in Paris tells important lessons for those involved in migrant struggles on the strategies used by liberal democratic states to contain them. If we anticipate these moves, how can we pre-empt them? And what strategic targets are based near you? 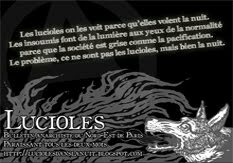 Original French text in Lucioles #23 with the title ‘Against states and their borders: revolution‘; roughly translated by Rabble. The massacre continues in the Med: hundreds of people die attempting to cross, fleeing poverty, persecution, and death (22,000 have died since the year 2000, of which over 1000 have perished this summer alone). Here, they find poverty, persecution, and death – like those gathered in their thousands in Calais, who are beaten by cops and some of whom die whilst trying to cross (11 since June). In Paris, a passage for those trying to reach the UK or Northern Europe and a stopping point for many who just don’t know where to go, all the gears of the state do their usual dirty work to hunt down undocumented migrants, to exploit the poor (with or without papers) as effectively as possible, and to keep us all in line – hard-working and obedient. So in late Spring, the Mairie (town hall) of Paris ordered the eviction of a temporary camp next to La Chapelle home to hundreds of undocumented migrants. Of course, the leftist Mairie played its cards democratically. The first hand was that of charity: hotel rooms were provided for a few days (before people were inevitably returned to the street), for the benefit of a public that expects these justifications. Emmaüs and France Terre d’Asile played their (profitable) game right by taking responsibility for a portion of these people. Management of poverty is their specialism – and it has nothing to do with the struggle to end it. Then for those who stayed in the street and sought a collective solution across different occupied spaces, there were various leftie factions: the Communist Party, the Greens (….) and the New Anticapitalist Party, who’d come to get cheap publicity and do the eternal work of the left, i.e: sugar the pill, make promises, temper the rage, and spread resignation. However, the most twisted card played by the State was that of division and recuperation: the card of asylum. It seemed that some of those living in the slum of La Chapelle were entitled to be granted asylum, having come from war-torn countries. Obviously, that ‘right’ is not guaranteed to all and resembles more of a lottery, paid for by the obedience of those that request it. But this trap served more than anything to separate the good refugees with the right of asylum from the bad sans-papiers that needed confining to detention centres and loading onto planes. It is understandable that people who are blackmailed for survival every day, faced with the threat of deportation back to the horrors they fled, would hang on to the hope of asylum. But we need to be clear that even if this is a partial solution for individuals, it merely reinforces the state’s anti-immigration policies. Sadly, it works. Already the fact that those supporting the sans-papiers refer to them as ‘refugees’ and demand their ‘rights’ is the sign that everything is geared towards the recognition of these famous ‘rights’ by the State. Rights that will be paid for by responsibilities and the exclusion of all those – the vast majority – who cannot access them. Power gives us crumbs to calm the passions and to distract us, while it continues to imprison and deport at all costs. Seeing what’s unfolding in La Chapelle, the Jardin d’Éole, rue Pajol and now the lycée de la rue Jean-Quarré (occupied by sans-papiers and their supporters), seeing the raids every day in the street, the obvious question we ask is – what can we do, what can I do, to stop this manhunt? Numerous ‘ordinary people’ have felt impelled to offer practical support in the form of food, clothes, and materials, or have helped out in the occupation or running of the spaces. This is laudable, but it’s not a solution to the problem of migrant persecution, nor that of the State (of which the first problem is part). The state kills, at its borders as at it’s centre, with its police and in its prisons… This society built on wealth and power kills quietly in our homes and workplaces, through poverty, abandonment and atomisation. The only real solution is to take the root of the problem, to attack the state and all authority, here and now, and refuse the false solutions that only strengthen the hold over our lives. A few years ago, here in Paris, the struggle against the detention and deportation of those without papers assumed the form of sabotage of the businesses that fed the deportation machine. Detention centre developers, banks, employment (temping) agencies that exploit them (as they do the rest of us), SNCF and AIR France which carry out deportations, charities that jointly run the camps; all of these were attacked and lost a chunk of money for their role in the deportation market. This example remains pertinent today and opens fertile ground for an assault on all aspects of that sinister world. Why not explore this again? Yet even in this atmosphere of general resignation, when begging for rights looks like a fight, little examples warms the heart. In rue Pajol in early June, sans-papiers and supporters organised a gathering which was surrounded by large numbers of cops. Local youth, driven by a healthy hatred of the police, came out with iron bars and attacked the police. Revolt is always possible!